We are with Katie, it looks like we're in a restaurant, apparently she's a waitress and she's working. I had started Silver for the Ireland Challenge but I couldn't concentrate so I stopped after reading the first chapter, I hadn't read in a week and I'm just starting this one so I can finish it hopefully by tomorrow. 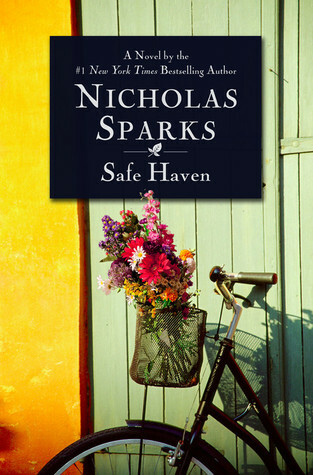 Labels: Nicholas Sparks, Safe Haven, who? what? where? This is bound to be a tear-jerker sooner or later. hahaha...Nicky Sparks always has one moment (at least) of where you can't help but tear up. Haha I like what Carole Rae said. You know that this is going to get so incredibly sad soon. Have you seen the movie or are you reading this first? Oh, and for some reason your feed on bloglovin' isn't updating. I was wondering where you've been but you haven't been anywhere, apparently! You may want to check to make sure your RSS feed is valid. Mine wasn't uploading a couple of days ago and all it took was for me to go to this validator, type in my URL and hit enter. It claimed that it was valid and that seemed to do the trick. I have no idea what on earth any of the other stuff that pops up means. I just closed the tab and a few minutes later all of my recent posts were on bloglovin'. Just thought I would let you know!